Country side drives Kathmandu to Arughat. Experience of Nepali and Tibetan culture as some part of Trek area is inhabitant of Tibetans. Cross Larkya la pass 5220m. Summit Sandu peak without Technical problem and without peak permit. Magnificent view of Manaslu as well as Annapurna ranges. 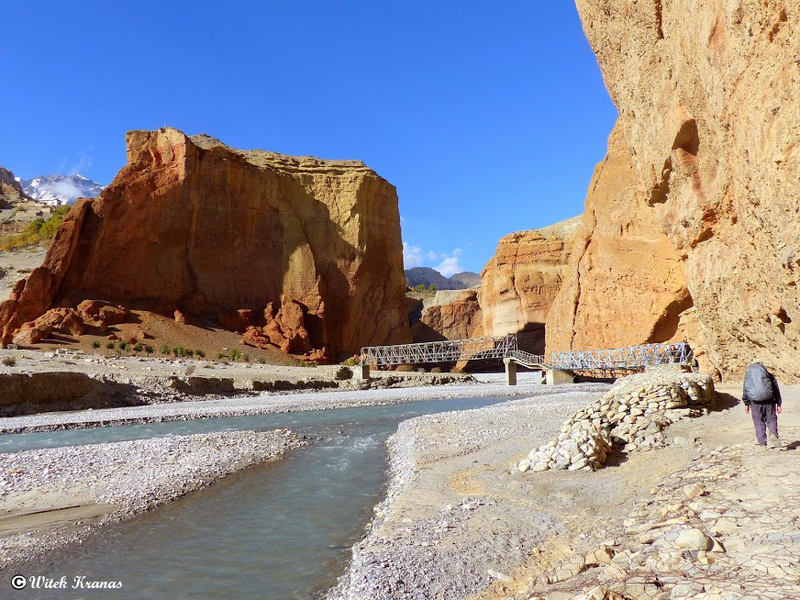 Upper Mustang trek or Lo- Manthang trekking takes us to off the beaten path of mustang valley. It is greatly influenced by the Tibetan culture and tradition. 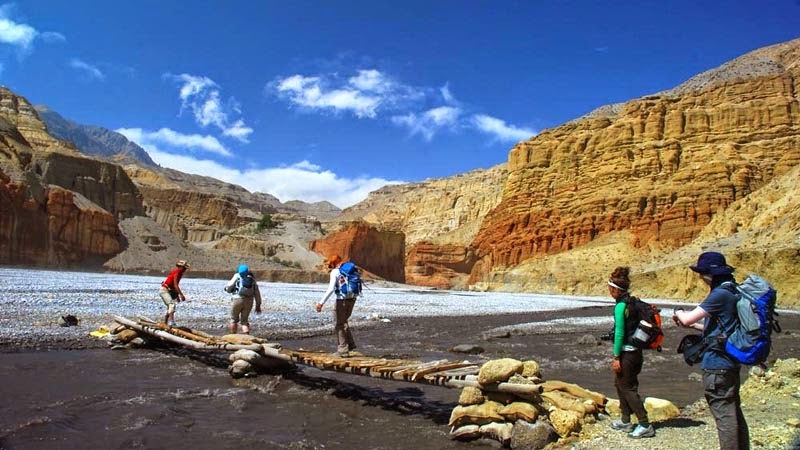 Upper mustang trek also offers quite similar experience as of trekking on the Tibetan highlands. The beautiful landscapes, visit to ancient monasteries, palaces and chortens along an insight to local tribes and inhabitants make us feel as if we are in the whole new world. The locals still follow their ancient rituals and cultural processions . We embark for our Mustang trek after boarding a flight from Pokhara to Jomsom .This trek is followed by initiation of trekking towards scenic barren landscape of kagbeni. Following the deserted trekking trails ahead, passing through grand kaligandaki canyon and river, we arrive at beautiful village of Chusang. We can witness the famous monasteries like Samye gumba and similar architectural monasteries at this region. The stone and mud bricks house gives unique highlights to this tour. Further trekking through Samar, Ghami, Charang we will arrive at Lo manthang. It is the picturesque village locally inhabited by Tibetan influenced “Lo” from Tibetan origin. Finally crossing the deserted lands of Mustang we pass through beautiful villages of Dhakmar, Syanbochen and back to Chusang, Kagbeni. 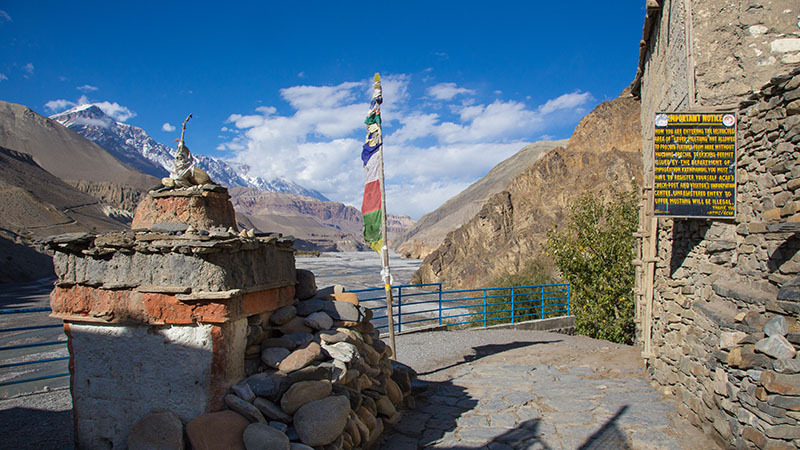 From this point there is an option to visit the famous Muktinath temple overdrive and drive back to Jomsom. This 13 days of adventure finally ends after arriving at Pokhara via air. Mustang region lies on the rain shadow area where it receives very less rainfall. 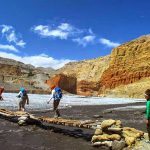 Therefore regarding the best season upper mustang trek can be joined during all around the year. To make your trek an ultimate unforgettable adventure, you should possesses good level of physical fitness and passion towards trekking, walking and exploring new places. Welcome by our representative at the airport, transfer to hotel in Kathmandu. Later in the evening enjoy Welcome Dinner. After breakfast we are going to do some sightseeing activities today. As planned, we are going to explore some of the most iconic UNESCO World Heritage Sites, later in evening drive back to hotel. Today we are going to head off to the famous lake city of Pokhara. The entire drive will take us about 7 to 8 hours to reach Pokhara from Kathmandu. We leave the noisy streets of Kathmandu and follow a winding roadway along the scintillating Trishuli river. Your eyes will be occupied by the views of green lush hills, small towns, people, markets and rivers. You can witness the first glimpses of Nepalese diversity of your trek while enjoying your drive. Later, after reaching Pokhara city, you and your friends will be escorted to your respective hotel rooms by our representative. The trip begins with a short, 30 minute flight to Jomsom from Pokhara. After catching up with the remainder of the team at the airstrip, the trek begins for the day. On the river banks of the Kali Gandaki, you follow the trail to Kagbeni. One & Half hours of walk through the barren landscape with heavy winds would take you to Kagbeni. From Kagbeni onward, the trail widens significantly with endless stretches of sand, pebbles and bounders. Small shrubs and thorn bushes are all you can see in the name of vegetation past this area. Despite of the deserted terrain, the trail is kept lively by several passing mule trains and horsemen. The Kaligandaki canyon is awe-inspiring and the trek on this day is uphill, quite steep at times up to the little village of Tangbe. After lunch, you would walk the flat path up to a fairly large village of Chusang, an interesting village with narrow covered alleys running through the center, inhabited mostly by mixed ethnic groups including Gurungs, Thakalis and some households from the land of Lo. Access to the Buddhist Gompa, constructed out of stone and mud, is limited to low-flow seasons only. The feeling of a distinct change in terms of culture, topography, landscape and lifestyle is prominent, having had entered into this long and secluded valley, having scattered settlements, mostly small and basic. The lack of ample rainfall delimits cultivation in sheltered plots of land, making the landscape of a pattern of brown with scattered patches and shades of greens. After crossing the Mustang River, we reach Chaili, a small but colorful village. The trail then veers along steep lines right up to the village of Samar, a very old and small village situated amongst a grove of trees with a stream running through the middle, making it a tough four hours walk for the day. As in all desert lands, settlements in Mustang are in oasis village most houses are constructed out of mud and stones with roof cast out of twins, straw and a mixture of mud and pebbles. After 05 hours walking we will reach to Ghami. Where we overnight in Lodge available there. The days walk is through perhaps the driest part of Mustang. Much of one’s energy is spent negotiating loose dry soil that give way every times you walk uphill, making it seem tiresome infertile at times. However, the magnificent views of the countryside the gentle contours of the north in contrast to the rugged mountain canyons in the east and west are the source in inspiration to walk on. A total walk of five good hours brings us to Charang, a large spread out village inhabited totally by the people of Lo who are of Tibetan origin. 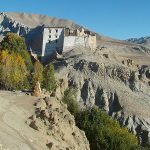 The old monastery and the adjoining Gompa are said to be some 500 years old and contain some of the finest religious wall paintings in the world. We spend part of this morning exploring this interesting village and its large old monastery. We then go a bit out of the way to see Dhakmar, a small-secluded village. Today’s walk is only for 4 hrs. But mostly uphill and then the trail flattens out till Lo Manthang, then capital of Mustang consisting of over two hundred houses. The entire village is walled and painted earth brown and white. Stay overnight at Lo Manthang. Today is the day to explore Lo Manthang. 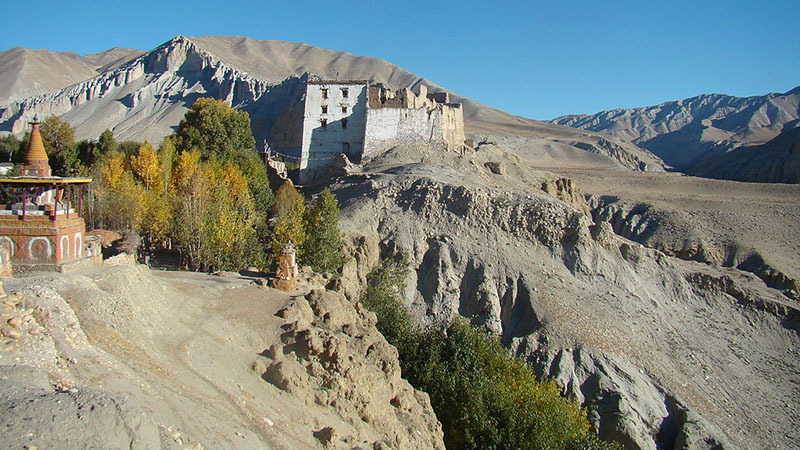 Visit the King’s Palace & the surroundings of Lo Manthang as well as the monasteries over there. Today the trail climbs steadily to a pass marked by a cairn, offering a last glimpse of Lo Manthang. The trail contours across the head of a valley and crosses another ridge, then drop into another large desolate valley. After ascending to the valley floor, the route heads to the right, up the center of the valley to it head. Cross a ridge at 4,070 meters & traverses across the heads of two more valleys to an indistinct pass. Cross the pass to some meadows & a stream. The trail then makes a long rocky descent down a ravine to a grassy valley where Lo Geker is situated in a grove of large trees alongside a stream. We will walk further to reach Dhakmar. A large stream meanders through this village, making this a particularly pretty valley. Most of the surrounding hills are pastel shades of Grey & yellow, but a huge red fluted cliff provides a dramatic contrast. The trail descends alongside the stone walls and fields of the extensive village, After 05 hours gentle walking we will reach to place called Syanbochen. From Syanmoche, Trek back to chusang for 5 hours. Today is the same way that you already had. The trail passes through villages like Tangbe. After Tangbe the trail still continues through the bank of Kaligandaki River as well as the windy landscapes & reaches to Kagbeni. 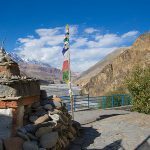 This day if you wish you can go up to visit Muktinath temple by jeep running there from Jomsom to Muktinath then drive back to Jomsom for night halt or simply walk back to Jomsom. Walk to Airport in Jomsom and fly to Pokhara Valley. Later at evening enjoy Farewell Dinner. 13 Days camp trek with full board basis. All Camping equipment’s like Dome tents, dining tent, kitchen tent, toilet tent, dining Table / Chairs etc. English speaking Sherpa Guide, Cook, Porters during the trek. Daily allowances insurance equipment, medicine and food for staff. Special Trek permit, National Park Permit & TIMS. Lunch and Dinner in Kathmandu(Except Farewell Dinner and Welcome Dinner). Any services not included in cost include section. Flight fair Pokhara to Jomsom and Jomsom to Pokhara.